AASHE is the leading organization that drives sustainability education into higher education. 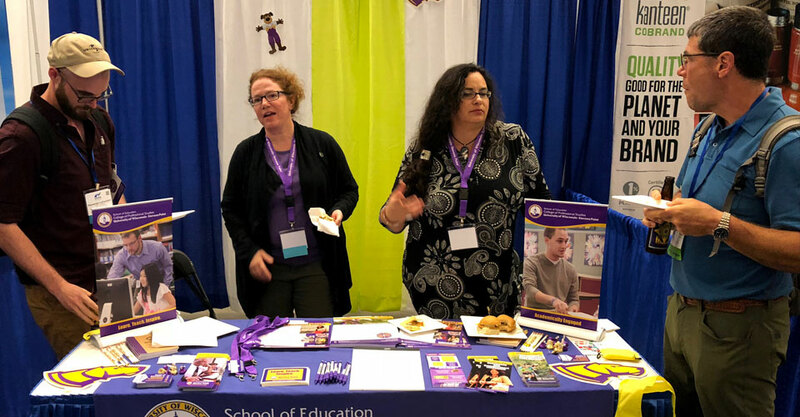 The organization has more than 900 members, of which UW-Stevens Point is a member, and members reach across 48 states, one U.S. territory, nine Canadian provinces and 20 countries and draws approximately 2,000 participants. With a theme of “Global Goals: Rising to the Challenge,” the 2018 AASHE Conference & Expo examines the critical role of higher education in achieving the United Nations Sustainable Development Goals (SDGs). Students and faculty are promoting diverse departments, their programs and initiatives. Professor Joy O’Neil, director of the Doctorate of Education (Ed.D.) in Educational Sustainability, Sustainability Coordinator Dave Barbier and students–including doctorate students Branden Lewis, Kim Wahl and Jie (Jane) Li–are networking, learning from others and representing their programs. In addition, an exhibit booth is showcasing the UW-Stevens Point College of Professional Studies, and additional graduate programs, including master’s degrees in Sustainable and Resilient Food Systems and Community and Organizational Leadership.